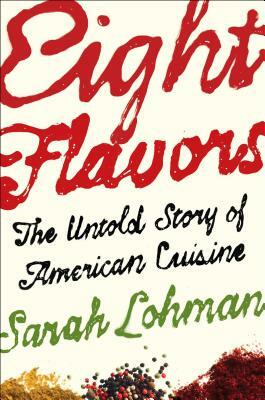 Eight Flavors: The Untold Story of American Cuisine (Hardcover) | Eagle Harbor Book Co.
Sarah Lohman is originally from Cleveland, Ohio, where she began working in a museum at the age of sixteen, cooking historic food over a wood-burning stove. Lohman moved to New York in 2006 to work for New York magazine’s food blog, Grub Street, and now works with museums and galleries around the city to create public programs focused on food. Her work has been featured in The New York Times, The Wall Street Journal, and NPR, and appeared in the Cooking Channel’s Food: Fact or Fiction. The author of the blog Four Pounds Flavor, Eight Flavors is her first book. "Engaging...[Lohman] writes with passion and insight." "Very cool...a breezy American culinary history that you didn't know you wanted." "Warning: This book may make you hungry." "Lively...Lohman will win you over with her detailed exploration of how each ingredient was introduced to the country and how it’s impacted our cooking over time." "Lohman's delectable book illustrates the deep connections between culture and food, reminding us that the flavors that enhance our foods represent the people who cook it." "A compulsively readable, surprising and deeply researched culinary history." "Packed with personality and a journalistic resolve to uncover the truth, Sarah Lohman's Eight Flavors takes deep dives into the history of some of the ingredients that define our modern American cuisine--from black pepper to sriracha to the oft-vilified MSG. You'll find yourself saying "wait, really?" at every turn of the page, ultimately coming out the other end with a deeper understanding of why our food tastes the way it does (not to mention helping you win the Food category at trivia night)."